This past weekend I was again honored to be asked to participate in the 15-team Tout Wars auction held bright and early on Saturday morning at Staten Island’s Richmond County Ballpark. After a short ferry ride, I caught up with old friends and then auction began. Like last year, it rolled at a fast pace and ended in about four hours later. While my final team’s roster doesn’t resemble any team I’ve previously rostered, it has a nice chance to compete. The biggest decision I made when constructing this team happened months ago when I looked back at my 2017 fantasy teams and found my pitching way outperforming my hitting. To help offset this final imbalance, I decided to go with a 70%/30% hitter/pitcher split. Over the past few seasons, this league’s split has been 67.8%/32.2%. The difference works out to a $6 difference. I am not married to reaching this exact mix at the auction but it gives me a general guideline to follow. It had a side effect I didn’t fully understand but the anomaly ended up driving my auction. 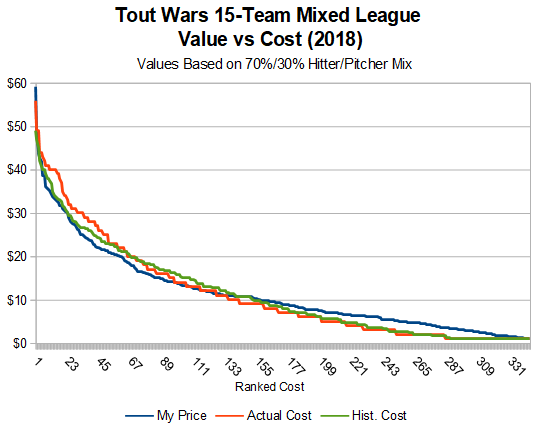 When calculating my values, I needed 70% of the $3900 auction dollars allocated to hitting and the other 30% to pitching. I expect the extra hitting dollars to be fairly spread out but they aren’t. Instead, more is allocated to the top dozen or so hitters. For example, using our auction calculator (I didn’t use them for this auction), Mike Trout is a $52 value with a 65% hitter allocation. If the split jumps to 70% hitting, he’s at $56. Using my values and calculations, I put him at $59 (two other owners admitted they had him valued the same but couldn’t pull the trigger). It’s a lot but he’s worth it, especially in an OBP league. So before the action, I had a decent idea I would own Trout …. … and I did for $56. After picking him up, I was bargain shopping. Here is my complete team with my values and what I had to pay (full results). The results were as expected once I paid up for Trout. In all, I spent 29% on pitching with the league’s overall number at 33%. My surplus production is quite high but it should be using my split and my projections. Brent Hershey of BaseballHQ had $56 of surplus value from his picks. Every owner needs to come out of a draft or auction with surplus value or they did something horribly wrong. Besides the heavy hitter split leading me to Trout, here are some additional thoughts on my team. • With catcher, I want something positive from them. Posey and Martin provide a nice on-base floor. • While Sano came at a discount, I was unhappy with the selection. I filled up my Utility slot early with many first base values still to be owned. • Jake Lamb was my least favorite pick. I got barely any surplus from my projection with the humidor and a possible platoon looming. • With my hitter heavy split, I had to spend a little more for top-end pitching. Historically, this league’s closers go for insane prices and this year was no different. I got Rivero and a few darts (Green, Gregerson, Strickland). I like Strickland’s Save chances with Melancon’s arm nearly dying. • I sacrificed WHIP and ERA (Gray and Archer) to get a nice strikeout base. I aim for three closers and I need each of my starters racking up the strikeouts. • I thought Shane Greene was called out at $1 and I upped the bid to $2. I won the bid and then found out I won Chad instead. Oh well. • I had a tough time deciding between Willie Calhoun and Lewis Brinson in the reserve round. I took Brinson based on his stolen base potential as I might be light in steals. • Finally, I was concentrating on outfielders in the reserve rounds after only spending $9 total on the non-Trout picks. We hoped you liked reading I Happily Paid For Mike Trout in Tout Wars by Jeff Zimmerman! When you say that you should always come out of an auction with surplus value, I hope and assume that you are not including keeper leagues with heavy inflation in your thought—it is practically impossible to come out of those with actual surplus value (surplus relative to inflation yes, but that is not real surplus), unless you bid exclusively on $1-$5 players (the only place to get surplus value in a league with high inflation), and that tanks your team production because you leave half your money in your pocket. Not all leagues are keeper leagues. you’re leaving out the part about keeper leagues where, you know, you have keepers accounting for your surplus value. This is a topic I write about at least once a year. If it’s keeper surplus value you’re hunting for, here is the formula for success. Even if you opt to zig because everybody seems to be following this strategy – creating huge value in the good-not-great category – you should make sure your 5 man bench (or whatever size bench) is all $1. The smaller the league, the more $1 players you should roster. For example, a 25 player roster, 10 team league should probably have 15 or more $1 players. A 25 player roster, 15 team league might be better served by 5 $1 players. This is an adaptation to replacement level. This is the strategy I follow in leagues that allow in-season moves. I acquire as much talent as possible, and fill in the gaps with add/drops and trades. Boggles my mind when people sit out the first 30 or so players auctioned. Hard to win without a 1st round pick!